METZ said recently in an interview with Brooklyn Vegan that “Earplugs are recommended” when listening to their self-titled debut LP. I would go further – crash helmet, knee pads and a lifejacket are a bare minimum. Never mind ear protection, you’ll be relieved to come out of the other side with all of your limbs intact. They're a band who’ve had to be patient, owing to a slow song writing process which has seen just a few 7” singles in the four years they’ve been together. Their sound relies a great deal upon the live set up which they’ve been honing in this time, creating a signature, demonic rhythm section that defines the majority of this LP. Headache and Get Off epitomise their relentless energy, one that feels like genuine angst, frustration and ambition; desperate to tear from their innards and discard with anything in sight. There’s a spiralling atmosphere which doesn’t dissipate the restless fervour but concentrates it and intoxicates every slashing guitar and pummelling drum fill. Rats stands out as a moment of clarity among the fuzz, drawing the sound towards droning melodicism which appears again on Knife In The Water. It’s a distinctive characteristic and one that creates an inclusive aspect and perfect counterpoint to the intensity which embodies the message - it’s sporadic and oppressed nature adds an acidic spirit which cuts through the wild and frantic energy. The abundance of riotous noise allows the band to simmer down at moments they find appropriate such as midway through Wet Blanket. It refrains from being merely an assault of aggression, instead adding subtle inflections that really make their sound. These are not accidents but neither are they preciously considered additions. Like all METZ music this is instinctual and powerfully confrontational but it’s not a one dimensional battering ram designed to destroy either. METZ admit to being deeply involved with every aspect of their band including the aesthetic. It’s very clear that the cover to this album actually means something, rather than just ‘being cool’ or whatever. You can imagine, and probably relate, to the monotony and helpless angst that attacks us when we’re a certain age, going through certain ritualistic processes of life. So imagine this record as the soundtrack to those feelings, and how liberating, not only that would have felt then, but does feel now. 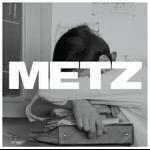 It’s impossible not to be enamoured with the spirit and the message of METZ. It’s an attack for sure, but not against a person or organisation or ‘the man’ or anything of the like that you would associate with punk music. It serves a greater purpose, one that strikes for something precious. This is METZ suggesting, insisting and demanding to be heard. Theirs is the voice of freedom and expression and we should all listen very carefully to what that means.